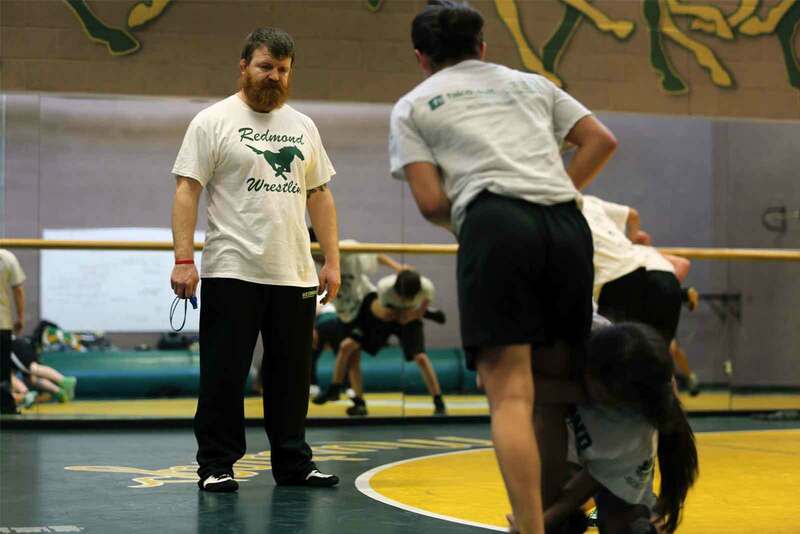 At Redmond High School, northeast of Seattle, wrestling coaches Robert Kaneko and Lantz Schwabenbauer not only understand the challenge of participating in an individual sport––they embrace it. “It’s you. It’s the other kid. And there’s no excuses,” says Redmond High School Wrestling head coach Robert Kaneko. “You can be as good as you want to be,” he often tells his wrestlers, stressing personal accountability on and off the mat. This “no excuses” aspect of wrestling is what Kaneko, who has been coaching wrestling for 27 years, loves most about the sport. Like Kaneko, assistant coach Lantz Schwabenbauer also has a long-standing relationship with the sport. After beginning his wrestling career on a YMCA rec team in junior high, Schwabenbauer wrestled throughout high school and college and even continued after entering the military, getting a couple seasons under his belt as a member of the All Army Wrestling Team. To these coaches, learning to wrestle is fundamentally about learning self-discipline. Kaneko describes the one-on-one structure of the sport as “pure,” because wrestlers have no choice but to own up to their shortcomings. It appears their approach to coaching the student-athletes of Redmond High School is working. In 2017 the boys’ team took the 3A KingCo league title and the girls’ team won the sub-regional tournament for the 2016-2017 season. With this much potential, both coaches noted the importance of having the freedom to cover more ground to seek out tougher competition. Unfortunately, the expenses add up fast. And despite their ambitious budget goals, Schwabenbauer admits that it’s difficult to carve time for fundraising out of their packed schedules. That’s why the Mustangs use fundraising platform Snap! Raise to help cover tournament fees and transportation costs for the wrestlers. With the Snap! Raise process, setting up a successful fundraiser takes less than an hour and little to no maintenance throughout the 28-day campaign. According to Kaneko and Schwabenbauer, the Snap! Raise fundraiser essentially “takes care of itself,” allowing them to spend their time and energy where it really counts: coaching their team. I always tell parents that you'll see more growth in maturity in your kid from the start of wrestling season to the end of wrestling season than anywhere else. The coaches' commitment to their team did not go unnoticed. In 2017, the same year that the Redmond’s boys’ team took the 3A KingCo league title, Kaneko was awarded 2A/3A Coach of the Year and Schwabenbauer Assistant Coach of the Year. The Mustangs start practicing mid-November for their 2018-2019 wrestling season and will launch their annual Snap! Raise fundraiser around that time. But Kaneko and Schwabenbauer are committed to making an impact that lasts well beyond the upcoming season. “I always tell parents that you'll see more growth in maturity in your kid from the start of wrestling season to the end of wrestling season than anywhere else,” Kaneko says. After 27 years in the business, he’s usually right. Redmond Wrestling uses Snap! Raise to easily and efficiently achieve its fundraising goals. Start a hassle-free fundraiser with Snap! Raise today!